Is Whey Protein better long-term compared to Casein? NO. More comprehensive studies have shown that slow digesting proteins result in better long term retention of valuable amino acids. These studies are far better to quote than BV studies. These studies by the European Center for Human Nutrition demonstrate what the human body does with proteins once consumed. They tracked radio-labeled amino acids through the body where they are sent, how they are utilized and also how much are retained in the body after 3 days. These studies show that slow digesting proteins are far superior to fast digesting proteins. The liver is the body’s filter and removes anything that is in excess in the blood. Whey protein (a fast digesting protein) releases a glut of amino acids into the blood stream. That amino acid sated blood flows through the liver and the liver begins to oxidize the amino acids for ENERGY to remove the excess from the blood thereby eliminating those amino acids from use in creating LEAN TISSUE. Bloodstream amino acid levels have been shown to actually drop BELOW BASELINE LEVELS within hours of consuming Whey Protein due to oxidization by the liver. When the bloodstream amino levels drop below baseline the body believes it is starving from amino acids and start cannibalizing LEAN TISSUE. YES, Whey Protein triggers more intense protein synthesis but without the ASSISTANCE of MICELLAR CASEIN ( a good slow digesting protein) will trigger muscle catabolism. 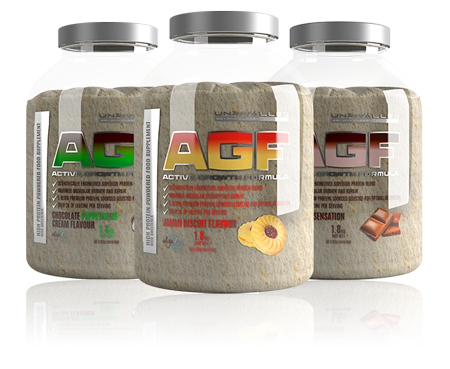 This is why in my opinion a High Quality Blended Timed Release Protein like UNRIVALLED’s AGF is a better option for MAXIMISING MUSCULAR GROWTH and REPAIR.